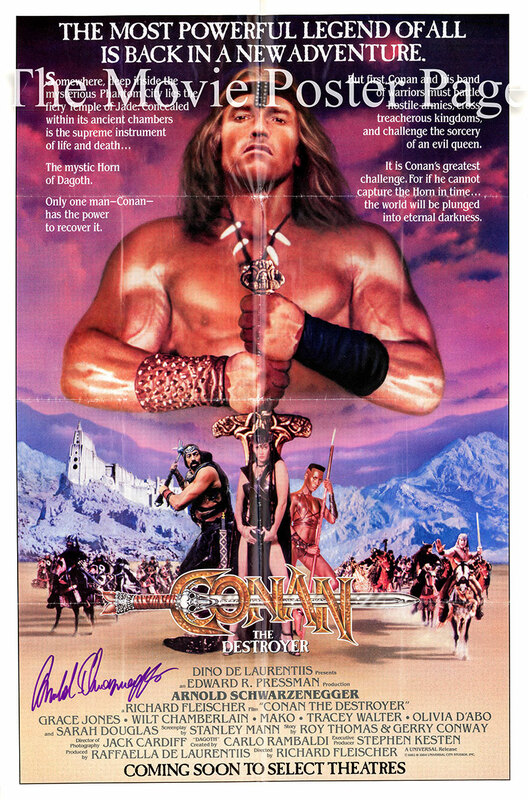 This is a signed 27" x 40" advance one-sheet poster for the 1984 Richard Fleischer film Conan the Destroyer based a story by Ray Thomas and Gerry Conway, screenplay by Stanley Mann and starring Arnold Schwarzenegger as Conan. Plot summary: Conan is a fearsome wandering barbarian who picks up random hero jobs. This time he escorts Princess Jehnna [Olivia D'Abo] to an island fortress, where Queen Taramis [Sarah Douglas] has sent them to retrieve a magic crystal.